Thirty-two-year-old Beto O’Rourke didn’t know what the text arriving to his flip phone meant. But he knew it was from the woman he’d taken to Mexico on a blind date three days earlier, and he figured it was a good sign. It was December 2004, and O’Rourke and Amy Sanders had parked near the international bridge and walked over the Rio Grande from El Paso to Ciudad Juarez. They got margaritas at the Kentucky Club, a cavernous, 99-year-old bar named for Bourbon distilleries that decamped to Mexico during U.S. Prohibition. They had dinner at Martino’s, an O’Rourke family favorite for Sunday lunch. Then they hit El Recreo, an unmarked and relatively quiet watering hole perfect for deeper conversation. Their last stop was the city’s cathedral and its side chapel, Mission Nuestra Senora de Guadalupe, where they debated when it was built. For O’Rourke, crossing the border that night was by design. Sanders was new to El Paso and he wanted to make sure she understood that it and Juarez “are two halves of a larger community” — and that the binational vibe was something she’d be into. The former Texas congressman is now a presidential candidate, undergoing his own, far more elaborate test of character. But El Paso — and by extension Juarez — remains critical. O’Rourke has made his far-flung, desert city a centerpiece of his public identity, a protagonist in his origin story and a talking point in his stump speeches. To O’Rourke, El Paso epitomizes the sort of rich cultural mingling and exciting, economic power that is possible when the United States and Mexico don’t live in fear of one another. On the campaign trail, it’s both symbol and sword, wielded to puncture President Donald Trump’s signature calls for erecting more and higher walls along the border. He’ll formally launch his campaign here Saturday, highlighting the border credentials that set him apart in the crowded Democratic field. The reality of O’Rourke’s relationship to El Paso is less gauzy, more complex. He spent much of his border boyhood itching to get out. He did, to an elite East Coast boarding school nearly 1,900 miles away. He returned home later to find his wife and political career — a career that was fueled financially at the start by El Paso’s wealthiest and most powerful business interests. O’Rourke’s early moves in public office rankled some of the communities he now holds up as models. And, though now he calls for tearing down the border walls that have stood between El Paso and Juarez in some form since the 1970s, O’Rourke voted just last year to approve new border barrier construction. Such decisions still touch nerves with some in a city that wrestles with divisions over class and ethnicity in ways O’Rourke rarely talks about on the trail. By the time Robert Francis O’Rourke was born a fourth generation Texan in 1972, El Paso was an industrial hub known as the blue jeans capital of the world. Levis, Guess and other brands sewed pants at local factories. White families like the O’Rourkes were in the minority; 57 percent of the population was Hispanic according to the 1980 U.S. Census. O’Rourke grew up in a well-to-do, hillside neighborhood of red-tile-roofed homes. They offered sweeping views of central El Paso, as well as the moonscape-like slopes of the Franklin Mountains, the Rockies’ southernmost tip. His family bought its home from a man who had installed a massive, rectangular swimming pool for physical therapy exercises. El Paso gets 300-plus days of sunshine a year, and the family spent as much time in and around that pool as possible. Juarez is right there, visible from nearly anywhere in El Paso, including O’Rourke’s street: Concrete canals section off a Rio Grande that is usually little more than a brown puddle. Low-slung, concrete homes and storefronts are flanked by bulbous foothills. A sea of lights cuts the desert darkness at night. “It just didn’t feel like another country,” said Rep. Veronica Escobar, a fellow El Pasoan who replaced O’Rourke in Congress after he vacated his seat to challenge Cruz. Despite such obvious, binational affections, some Mexicans resented having their “otherness” highlighted, then and now. O’Rourke has observed the classist undercurrents permeating the El Paso-Juarez relationship, even as he also has perpetuated some of the same stereotypes. The O’Rourkes were part of the city’s elite. The future presidential candidate’s mother ran an upscale furniture store, Charlotte’s, founded by her own mother. His father, Pat, was a Democratic El Paso County commissioner and county judge. He switched parties and ran as a Republican during an unsuccessful 1992 congressional election. O’Rourke’s mother, Melissa, says her son, the eldest of three kids, became fluent in Spanish listening to household maids and Mexican friends. O’Rourke, who played soccer growing up, recalls heading into Juarez for classmates’ birthday parties. He was called “Beto,” a common nickname in the region, as a baby. O’Rourke now describes El Paso as where “Texas meets the rest of the world” and the nation’s new Ellis Island, but as a teenager he felt isolated and longed to get away from the West Texas desert. He wanted to live where the pace was faster, the music hipper and the possibilities for a bright future boundless. “When you’re growing up there, it’s a long way from anywhere,” says Mike Stevens, who first met O’Rourke in basketball camp the summer after 9th grade and would later be a member of a punk rock band called Foss with which he and O’Rourke toured for two summers during college. After ninth grade at El Paso High School, O’Rourke told his parents he wanted to go away to school. He landed at Woodberry Forest, an all-male boarding academy in Virginia about 80 miles from Washington. His step-grandfather, a Fort Worth bank president named Fred Korth who had been John F. Kennedy’s Secretary of the Navy, was an alum. “It was a challenge to be at that school, the student body was so different, the work level so different than in El Paso,” Melissa O’Rourke said. O’Rourke went from Woodbury to Columbia University and then to drifting in New York City. He spent nearly four years working as a nanny, a mover for a company specializing in transporting fine art, a publishing house proofreader and for his uncle’s web company. One day, while squeezed into a subway car commuting from a Brooklyn loft he shared with friends to his publishing job in the Bronx, he said he realized he’d had enough. 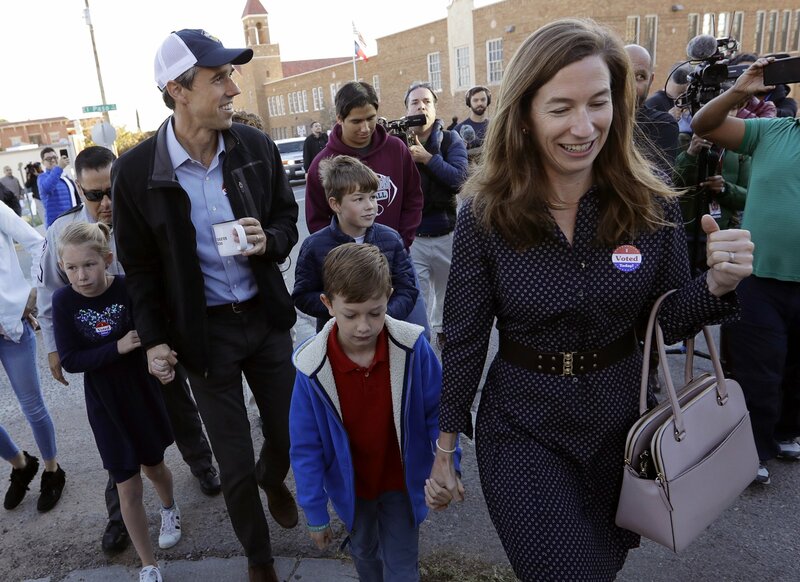 O’Rourke insists he wasn’t drawn home because he thought it would be easier to make his way professionally, and eventually politically, as a big fish in a smaller pond. He initially thought he’d work at the family furniture store, filling in for a recently departed inventory manager. He instead founded a web design firm out of his apartment, calling it “Stanton Street” for one of the city’s main arteries, after cursory research revealed that the local online market was still relatively untapped. O’Rourke joined civic organizations and volunteered with community groups. He found his focus. And he eventually would find politics. O’Rourke eventually began telling friends he was concerned about young people leaving El Paso in droves, just as he had once done. Combating “brain drain” became a centerpiece of his run for City Council, which he announced shortly after the blind date with Amy Sanders. Most El Pasoans stopped visiting. But the bloodshed to the south was also to their own city’s economic benefit as tens of thousands of people — including, at one point, Juarez’s mayor — fled their homes to reside in El Paso. O’Rourke served on the Council from 2005 until 2011 and initially supported a downtown redevelopment plan that sought to make over some of the city’s oldest neighborhoods — hoping to potentially increase property values and benefit major real estate interests, including those of his father-in-law, William Sanders. Amid complaints he was choosing developers’ needs over those of longtime residents, O’Rourke refrained from voting on the issue and the plan was largely scrapped, but not before he cast a key vote that some residents argue allowed the city to displace poor Mexican families. The vote on a January 2008 city ordinance sought to limit “the use of the power of eminent domain on non-blighted private property” and, residents say, could have stopped officials from forcing people to move out of downtown neighborhoods like Duranguito to make room for a multi-sport arena. The measure was defeated 4-3, with O’Rourke among those who opposed it. Construction on the project still hasn’t begun. O’Rourke counters that he never expressly voted for eminent domain and that he’s been able to win over many of the downtown residents who once criticized him. “Those are my neighbors, those are my friends, those are the people that I care about,” he said during a town hall in 2017. In the hallway is a painting by Sanders’ aunt, Beth Galvin, an artist and the matchmaker who arranged the blind date. It’s a reminder, O’Rourke says, of the union and the place that made it happen.